To better organize your email messages, you can move them into to folders named for their content. If you need to, create a new folder. To select a few email messages at a time, click the individual boxes to the left of each message. 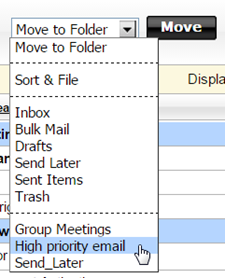 To select all messages in a folder, click the check mark in the header above the email messages. At the top of the page, click the Move to Folder menu, select the name of the folder you want to move the messages to, and then click the Move button.